Entombed beneath the sands, awaiting resurrection as the sun-bronzed warrior kings they were promised to be and subsequently resurfacing as withered, undead abominations has left the Tomb Kings vengeful and jealous of all living beings. Driven by vengeance & the unending need to conquer new territory, they along with legions of their loyal former troops and towering enchanted constructs have one goal……to defeat all who stand in their way! Personally, this was of huge importance to me. Having been, without doubt, my most eagerly awaited wargames release of perhaps the last decade! Since GW first mooted the concept of an undead army based upon Ancient Egypt it has had me gripped. The new Tomb Kings army book is 96 pages of fantastic imagery that continues the new hardback format. The entire publication is presented in glorious full colour, although, in keeping with the new format, it has a much darker feel. As one has come to expect from GW the book is replete with many beautiful, new works of art. All of the information is presented in an updated and easily understandable way. What was really important to me was what changes the near nine-year-wait for a second book would bring? Again, a book review coming on the basis of not having ‘field tested’ the army under 8th edition rules, one could not hope to unlock all of the subtle nuances that will no doubt arise given the sands of time (pun intended!). I could not help but feel that this time they had got it right. The addition of the much-needed Necro/War sphinx (reviewed separately) adds the, now mandatory, ‘Big Guy’. This direction was almost inevitable to keep the army ‘in pace’ with all the rest, while the iconic sphinx made the choice almost obvious. 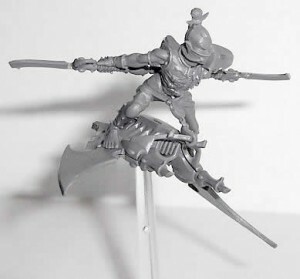 But the addition of the Necropolis Knights/Sepulchral Stalkers, the as yet unseen Heirotitan (wave 2 anyone? ), and the Ushabti with strength 6 bows were all a little less obvious (but all very welcome indeed!) as was the ability of the Tomb Prince/King to bestow his WS on all in his unit. Reduction in points for the basic skeletons was a must along with the introduction of Arkhan and the Necrotect character. Bringing the previously unique magic phase into line with 8th Ed rules was a move, which to my mind, was both inevitable and necessary. Removing the ‘stumbling around’ created by the lack of knowledge on the part of any opponent (or, indeed, the player himself) of a magic system which was anathema to the newer, faster rules was a sure sign that this was an army to be taken much more seriously this time around. The removal of the ‘uniqueness’ of the Tomb Kings magic is a two-edged sword. I could whine about my favourite models (the Ushabti) taking a hit from strength 6 changing to 4 and the lack of reinstatement of any Mummies being a chance left wanting. However, these issues are all cosmetic. Otherwise, everything is much better. A somewhat unknown quantity due to the timing of this review, however, I sincerely believe the Tomb Kings time is at hand and many seasoned players will underestimate them at their peril! My initial gut feeling, is that this new army book will put the Tomb Kings much higher up in the rankings. Definite tourney winners in the near future me thinks! The production values, quality, appearance etc. are all unequalled in the hobby. An essential purchase for any serious Warhammer Fantasy Battle player. 8/10. Robin Cruddace, step on up! A surefire hit certainly not a hint of disappointment, at least, not on my part. as a time-served apprentice in the Khemrian way! What has been so long in the making has been worth the wait. Having been of the opinion that the Tomb Kings concept was brilliant in 2002, the preceding army book had a feel of having been ‘rushed out’. This book by comparison shows much greater consideration and understanding for the subject matter. 8/10. Still, that’s an average of 8/10 overall & my Mummy gives a big, bandaged thumbs up! *Accurate as of 28th April 2011. Grey Knight Terminators (GKT’s) are a mainstay of Grey Knights forces, they’re able to teleport straight into the thick of the action, or fire their heavy weapons whilst relentlessly moving forwards from their own lines. 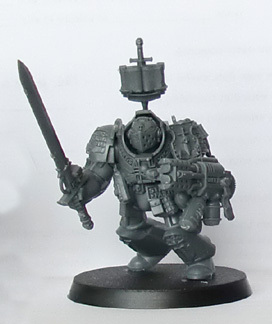 Whilst other Space Marine chapters may have a few score suits in total, the Grey Knights pretty much have a suit for every battle-brother, a privilege granted to them due to the dire threats they must face on a daily basis. 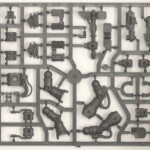 This review concerns itself with the new plastic GKT kit released by Games Workshop, which allows you to build up to five Terminators or Paladins, including a Justicar or Apothecary. One of the main benefits when an old army is remade is that the models get redesigned and remade in plastic; certainly, the Dark Eldar release benefited hugely from a complete redesign. 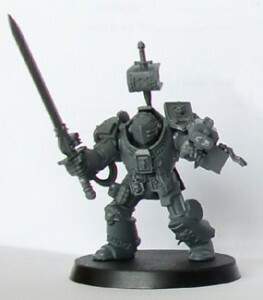 But when the Grey Knights were announced, with new plastic kits to replace the metal sculpts, there was a good amount of trepidation amongst players. Most people liked the old models, and didn’t want to see them become invalidated either due to a completely new design for the models, or due to scale creep (the tendency for new releases to gradually get taller than older models over a number of years). Happily, in this case the old and the new sit together very well, the style has been retained and they are at the same scale. 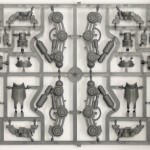 That doesn’t mean that the plastic miniatures are basically the metals done in plastic; there are a number of subtle differences between the models. The plastics have a hood-type affair now, but hopefully this doesn’t mean that they’ve now taken to hanging out over the balcony at your local shopping centre. The detailing on the armour plates has also been updated: the writing is now more clearly defined and all the edges are much sharper. The sharpness extends to the all the components: the helmets, weapons, and bling have good definition too. 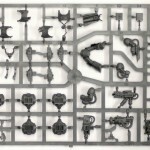 The components are packed closely together on the sprues, and many of the parts are fragile, or fiddly, so unclipping the components is a fairly fraught process. This is another kit where the parts are attached on the parts where you want things presented at their cleanest and smoothest, and this does take a bit of work to clean up. The review kit had a number of mould lines in inconvenient locations – these weren’t the worst examples seen – but it was another thing that needed some attention before the building process could begin. It proved difficult to get a clean contact between the limbs and torso, real attention was needed to make sure that the parts were touching correctly and the parts needed to be held for longer than expected for a satisfactorily strong join to be established. I don’t usually bother with instructions, but with the number of options in the kit i thought I would have a look. Unfortunately, I think it left me more confused, as the explanations for building each type of miniature were a bit muddled. I think that having a basic diagram showing the core build of the marine, followed by sections showing the alternative builds would have worked better. These problems are all quite minor though, as for all these quibbles the kit is pretty great. It is possible to make a great range of poses for anything from attacking terminators to a more heroically posed model. There are lots of small extras that you can use to add extra details to your marines. Little really does mean little though, when using the model some forceps would have been useful, as well as a scalpel, someone to wipe my brow and perhaps a full medical team in attendance too. I exaggerate of course, but I was worried about losing some of these smaller parts. 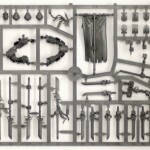 There are also multiples of most of the weapons – certainly your bitz box will be fuller when you’ve finished. The notable exception being that there is only one Daemonhammer supplied, so expect to see the business press listing its trade price next to Gold and Platinum. 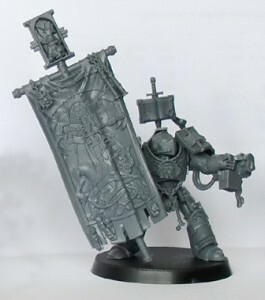 The Grey Knight Nemesis Dreadknight (which for my sanity’s sake I will refer to as the DK, just don’t start thinking I’m talking about a publisher) is probably the most talked about new thing in the Grey Knights release. It’s something quite different from anything they’ve released before, perhaps being most similar to a Penitent Engine in looks or a Wraithlord in terms of game mechanics. This review is going to focus solely on the model, the aesthetics and how it builds, rather than how it plays “in game”. Like most of the recent kits from Games Workshop, the sprues are densely packed. Perhaps they’re getting a bit too packed though, it seems to be getting increasingly difficult to cleanly clip components of the frames these days. Mercifully, there are not too many mould lines to clean up, though a major gripe is how many of the attachment points to the frame are on the smooth flat armour surfaces, which need a lot more care and attention in order to get the smooth finish that a model like this requires. 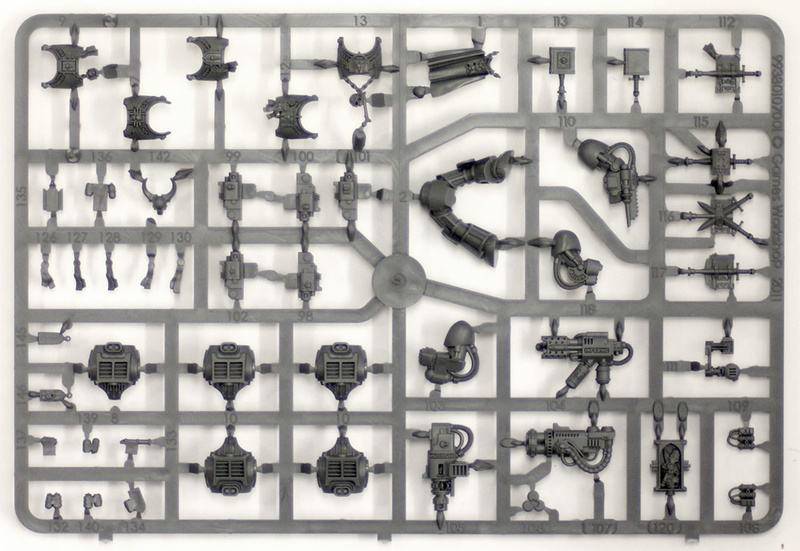 GW have also started numbering the components on the sprues, to match with the illustrations on their instructions. This is a good idea, but it’s an idea that has been poorly executed. There seems to be no logic to this numbering. 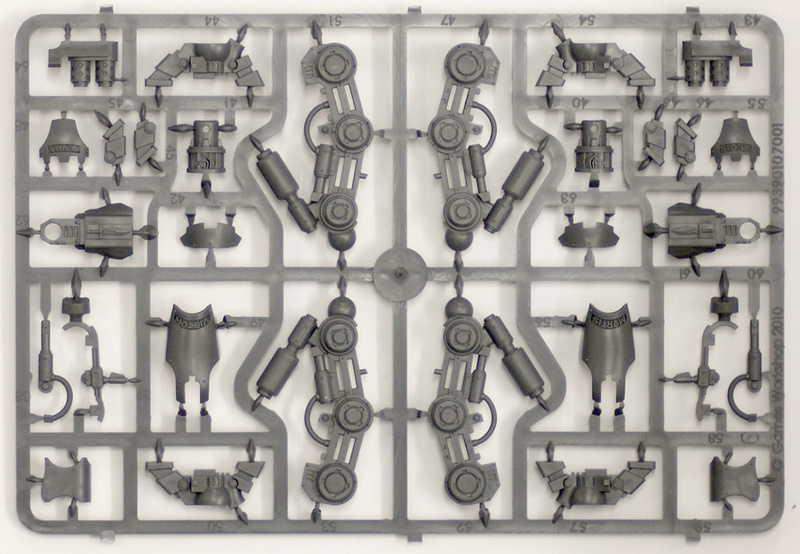 If for instance components 5 and 6 are to be glued together you would suppose that they would be next, or at least close, to each other on the sprue. In actual fact they were not even on the same sprue, part number 5 instead sitting happily amongst the 70’s and 90’s on another of the (in total) 3 sprues supplied. A minor annoyance, but one that could have been easily avoided by using more intelligent numbering. When looking at the preview pictures, the fairly static poses that the figures were given caught the eye; leaving me wondering whether this was intentionally done by the painter to show off the detail, or a limitation of the kit. Well, on building the legs it became apparent that it was the latter. 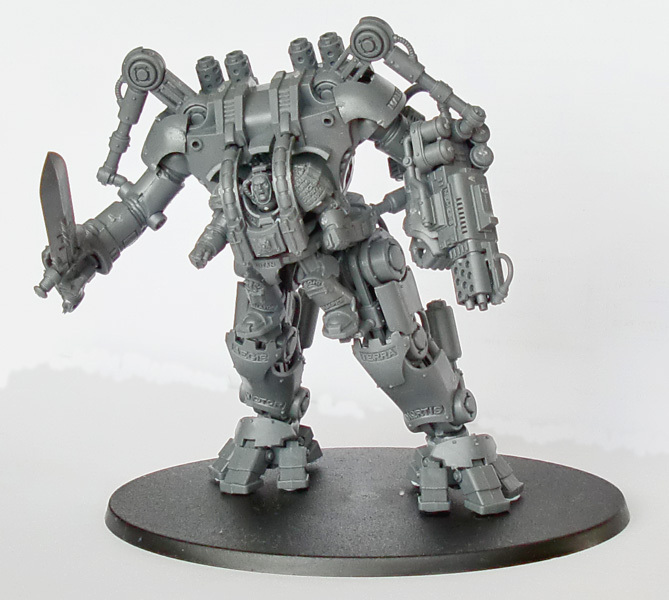 Not only have the designers not given you an out of the box way to dynamically pose the legs, they have designed the model to actively make it difficult to achieve such a goal, because of the way the terminators pilots legs attach to the DK. When the DK has legs that are so much longer than those of the dreadnought it really feels like an opportunity has been missed, especially when you think of the Sentinel kit and how the newer version came with improved knee joints for extra pose-ability. The same is also true to a lesser extent with the upper torso, the pistons that control the movement of the upper arms effectively prohibit completely free movement of the limbs, and the arms are a bit too short to allow a two handed sword holding pose. Speaking of the weapons, there are only parts to fully build two of the three ranged weapons (the Heavy Psilencer, the Heavy Psycannon and Heavy Incinerator); this is also the case for the three right-hand close combat weapon options (The doomfist, Nemesis Greatsword and Nemesis Daemon hammer) [what is it with GW and their increasingly stupid names ? – ed], though those with some sculpting skills should be able to quite easily build the missing part of the hand that’s required. This would then mean that with a bit of magnetic magic you have swappable weapons options for your DK. Now we come onto my thoughts on the look of the model, which admittedly are purely subjective, so you may feel inclined to disagree. As Paul said in his Grey Knights preview piece, it’s difficult to say whether I love or hate this kit, I guess in reality it is a bit of both. I like the overall slickness, but I think it has been spoiled by some of the additions like the pistons controlling the arms, and the “headless horseman” aspect of the design. Then there is the writing, technically a great achievement, again showing how far GW have come with plastics, but with the words themselves just a touch silly – I think I would have preferred that they stuck to the cod-latin stuff. And then there is the pilot, in what can only be described as a baby harness. A veritable behemoth that builds it’s lair in the deepest darkest depths of the forest, where nothing is safe from it’s rapacious appetite from careless Beastmen herds to the mighty Cygor. Canny and cunning as ever, the shamen of Forest Goblin tribes have developed methods of cajoling or coercing the services of these gargantuan beasts. 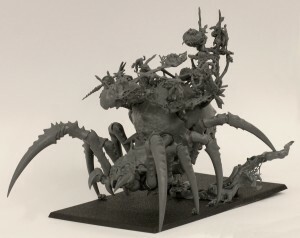 Bedecking their enormous carapaces with comic-looking howdahs, weapon platforms or shrines, enables even the least threatening greenskin to command ultimate respect as they power forth crushing all in their path….. 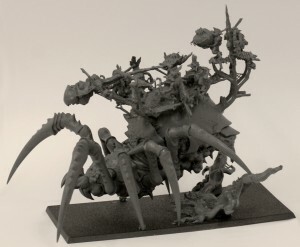 The Arachnarok is a rare troop choice from the Orc & Goblin army book, but may also be taken as a shrine mount for a Goblin Great Shaman or carry an upgrade ‘flinger’ that is a unique war-machine. Like a child fed on E-numbers for a week (I’m a dyed in the wool Greenskin at heart! ), I was almost unable to control my excitement at being given the opportunity to assemble and review this creation. When I finally got my clammy mitts on the goodies I was blown away! I must admit to being a little intimidated as reality hit home, could I do justice to the sheer level of detail portrayed over such a huge kit? Only time would tell……. 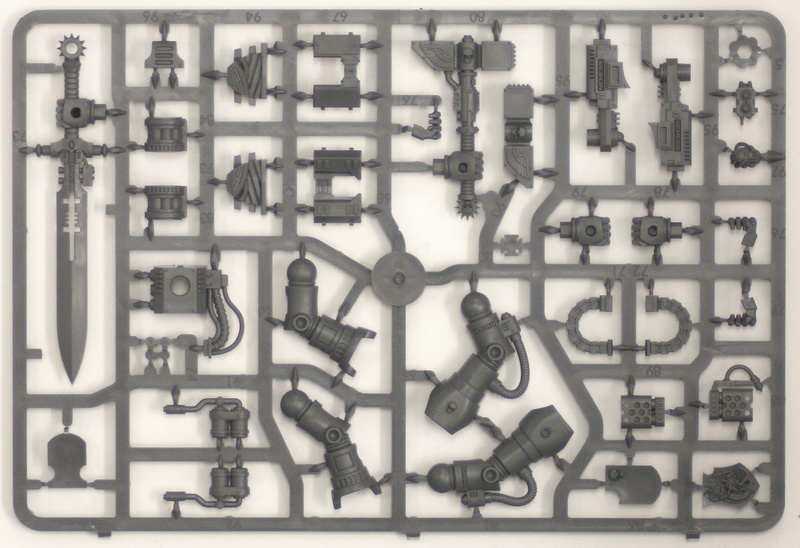 The 95 part kit was, as expected, up to the usual phenomenal standard one would come to expect from GW’s current plastic output. The individual details are portrayed perfectly in every aspect of the kit, from the humour of the goblins to the utter horror & revulsion created by a spider the size of a large two-storey building. Warning! Staring at the components can cause delay in assembly. I’m an experienced model maker (with 30 years experience), but was under no illusion, having perused the instructions, that I would not be calling on ALL those years experience. The build got under-way at a flying start. The assembly of the actual spider proper (up to and including part 41), was a cinch. The parts were expertly designed to ‘click’ reassuringly into place during dry-fitting and each overlapped subtly to hide prominent seams. My relationship with this kit began to show signs of strain as the instruction manual entered phases 6 & 7. At this point you are going to be putting some terra-firma under your not-so-wee beasty (basing). The manual will have you believe that your base is square (which it clearly isn’t!). TOP- TIP 1. Remember your spider needs to face one of the short sides of your RECTANGULAR base! ( I nearly didn’t!). From part 8 of the instruction manual we were heading for marriage guidance! The assembly & attachment of your howdah, (prior to deciding your final choice of build), requires a steady hand, persistance & an inexhaustible patience! TOP-TIP 2. When the instructions advise a dry-fit assembly, heed the advice! On fitting the howdah, it’s decision time. For our review model, I took the decision to build the one choice that would use the most parts! So, we were going to end up proud owners of a ‘flinger’ (an impressive mobile artillery platform). It was from here on in that the kit became a little ‘testing’. The various howdah options all required some seriously fiddly work, and it was at this point that my one and only gripe arose. I found the instruction manual to be not only inaccurate, but the diagrams were often misleading or at best unclear. Fortunately, the kit was so good it didn’t detract too much from my enjoyment of the overall experience. 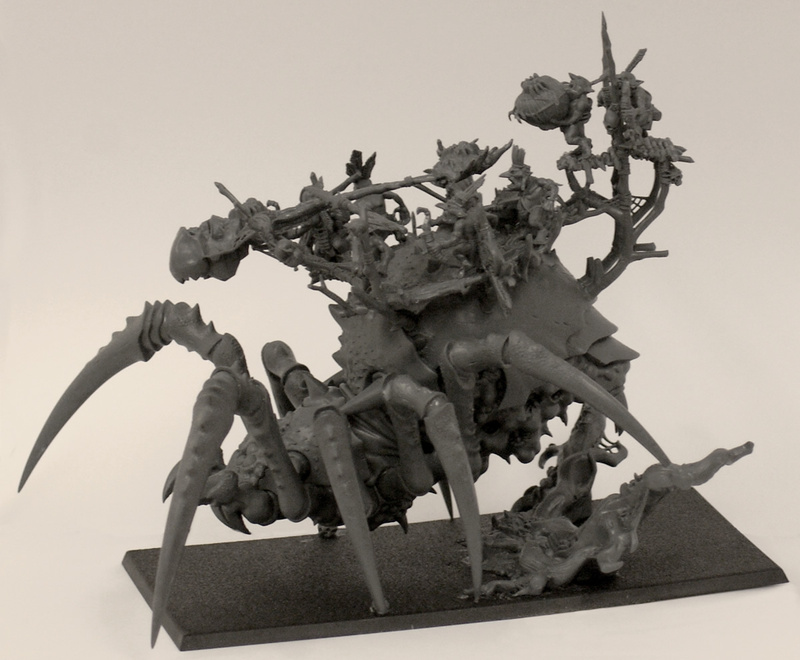 As a basic model with no upgrades your Arachnarok will weigh in at a hefty 290 points. So if you’re playing 2400 point games why not take two?! The flinger upgrade is only 30 points and the Catchweb Spidershrine only 40. The bog-standard 290 pointer hits home with 16 attacks on a 100mm frontage. Eight of those are poisoned & strength 5! For just 10 more points, the added shrine will give your Great Shaman the ‘Loremaster’ special rule. If you consider that the upgrades are in addition to the basic attacks and then add the thunderstomp as a final flourish you can rest assured that the Orc & Goblin Army has just joined the big league…..quite literally! Without doubt a high scoring delivery from GW with an overall web-tastic 9 stars! Only (maybe harshly) reduced from the maximum by the problems arising from a poor set of instructions. Accurate as of 18th February 2011. 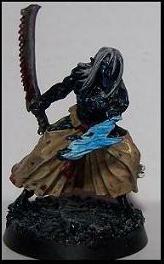 Wyches are Dark Eldar who have devoted their entire existence to the mastery of gladiatorial fighting. In the arenas of Commorragh they battle each other, slaves and captured beasts all for the amusement of the depraved spectators coming from all levels of Dark Eldar society. Whenever the Kabals gather force to raid real space the Archons will go to great lengths to enlist the support of the Succubi and their Wyche Cults. Wyches are a Troops choice for the Dark Eldar, though this kit can also be used to build a Succubus HQ model or even the Elite Hekatrix Bloodbrides. 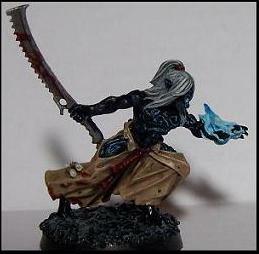 I have always been a fan of the Dark Eldar, heck I even enjoyed the old models, especially the Wyches. However the test of time wasn’t very kind to them, luckily GW finally revisited the Dark Eldar this year. The Wyches may be my favourites models in the new range, they just looks so dynamic and agile. The Dark Elder Wyches boxed set contains enough parts for 10 Wyches on two plastic sprues and costs 15 pounds (or 12,30 if you buy them from Big Orbit games). 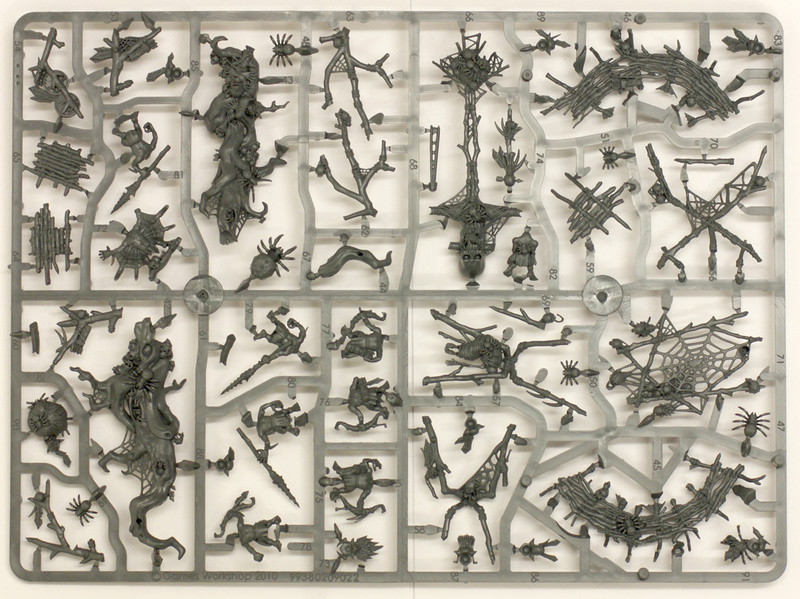 The box gives you a whopping 92 pieces to put together 10 Wyches in a large variety of ways. Each Wyche comes in a minimum of seven pieces; 2 chest pieces, a set of arm, a set of legs and a head. Wyches are described as being pre-dominantly female and the box gives part for six female and four males, interesting to note though is that nearly all men have partially obscured faces. So the focus is definitely on the ladies in this kit. All the legs have been labelled to make assembly more straightforward, although with a bit of cutting and conversion work you will be able to put legs together that normally won’t fit. 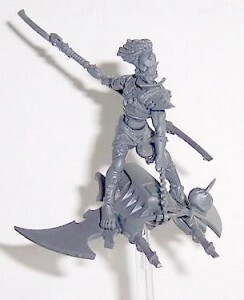 Though this will require more work it will enable you to add even more poses to a large Wyche Cult army. 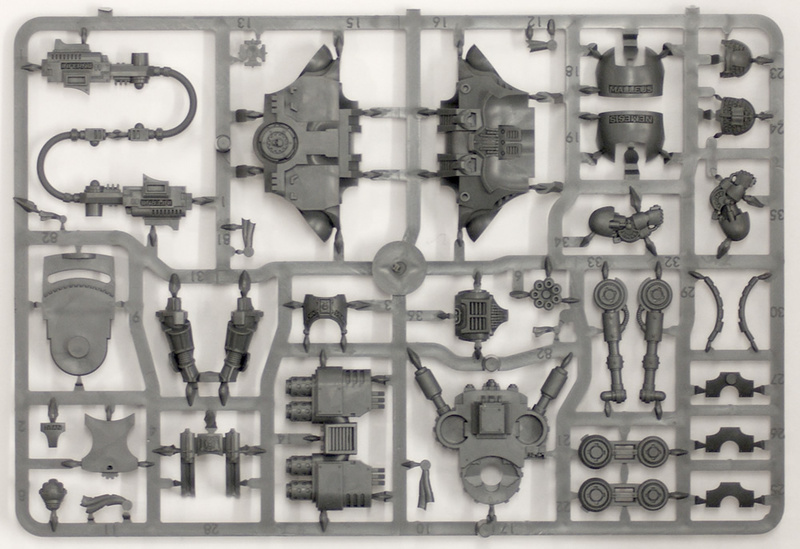 In addition to enough bits to arm all your Wyches with their basic kit you also get the necessary materials to put together a Hekatrix leader, as well as a set of all the special Wyche weapons. The Hekatrix comes with all the available options, save for a Venom Blade and the Phantasm Grenade Launcher. The first is easily solved as a quick green wash over a metal blade will make it look rather venomous. The Launcher is more challenging to solve, though you can of course borrow one from a Kabalite Warriors box. The only downside of the kit is that you only get one of each special Wyche weapon while a standard Wyche unit will be able to upgrade one mini per five with a special weapon (Hekatrix Bloodbrides can even upgrade one per three mini). So if you want to add two of the same weapons you will need to get a second box or get a little creative. TIP: Want to add more of the same weapon, but don’t have the bits or extra cash? Then take a hint from the Imperial Guard and field those special weapons in weapon teams. Simply give one Wyche the Impaler and another the Shardnet, the same goes for the Razorflails and the Hydra Gauntlets. Don’t forget to remove the splinter pistol or close combat weapon from the other hand, this as the special weapon is meant to replace both of these. The special Wyche Weapons also look great and even come with some extras. The Shardnet and Impaler are not much more than a net and spear, but this isn’t true for the other weapons. The Razorflails are weapons that can be fielded as both swords and whips and you actually get two weapons, one in each form. I thought it is also rather cool that you get a special, ritually-scarred head to go with the set. And finally we have the Hydra Gauntlets, whose wielders have a fully armoured helmet that will offer the needed extra protection when wielding these sharp and shattering weapons. Wyches are superb close combat fighters but they definitely need an effective delivery device in order to get the most out of them. If left to walk across the battlefield they won’t last long, possessing on a 6+ save. You basically have three different methods of getting them into close combat, mount them on a Raider, a Venom (only suited for small units up to 5 models) or let them arrive through a Webway Portal. Once they get stuck in though things get very interesting as they are both able to assault into cover and have a healthy 4+ save once in close combat. Add in a Hekatrix and a few weapons and you have a very formidable fighting force that will rack up a pain token very fast giving them Feel No Pain as a bonus. The special Wyche weapons are also rather interesting. The Impaler and Shardnet will allow you to take away attacks, which can be very effective again strong and high attack opponents. Razorflails, on the other hand, will allow the wielder to re-roll failed to hit and to wound rolls. And, finally, Hydra Gauntlet will give you +D6 rather than the normal +1 attacks, making this an ideal weapon when wielded against large masses of weaker opponents. The Elites version of the Wyches, the Hekatrix Bloodbrides, quite simply do the same as Wyches just better and with more special weapons. Furthermore you can also make a HQ Succubus mini with this kit. Being the cheapest HQ choice and adding them to a Wyche squad will often ensure they make it into close combat to do quite a bit of damage. 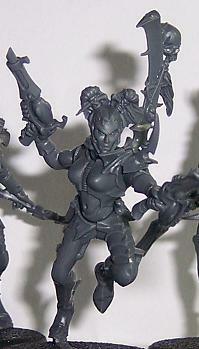 Like pretty much all the new Dark Eldar toys Wyches require a bit of time and work to look decent. With the many different layers (skin, Wyche suit, Wyche armour, trophies etc) and segmented armour it is easy to mess things up. My main advice would be to take your time with each mini as it will really show once they’re all done. For conversion opportunities you could look at the unhelmeted heads from the Kabalites kit, leftovers from the Hellions and there are even a few ideal bits on the Raider sprue to make your own Impaler and Shardnet! The pictures of painted Wyches in this article make use of these simple, yet quite effective bitswaps to add even more variety to the unit. You could also use a combination of Wyche and Hellion bits to make a custom Beastmaster. 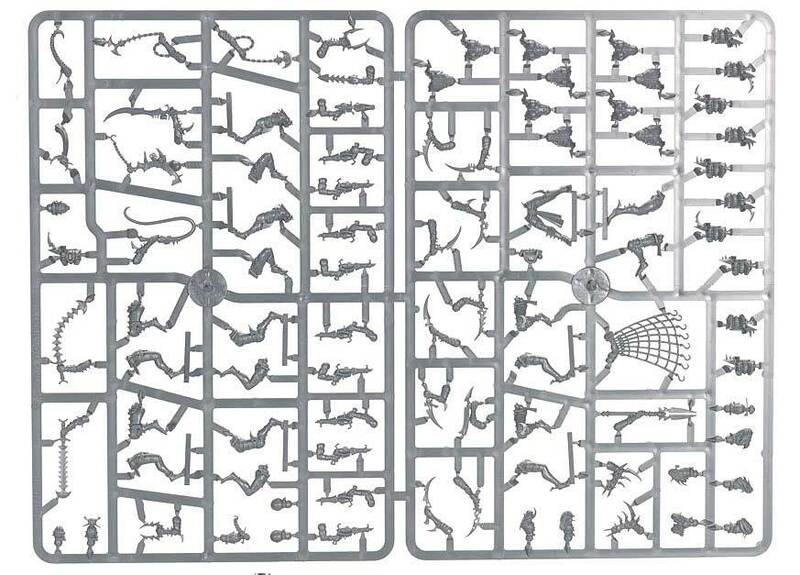 Finally, if we are to believe the rumors, Games Workshop will be releasing a plastic Venom kit in a few months which is supposed to come with some Wyche crew hanging off it. 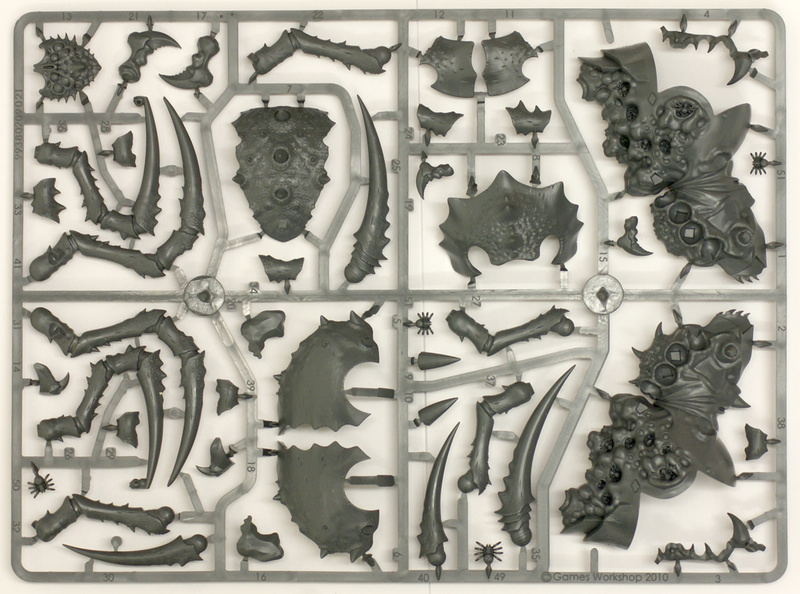 Those bits are bound to add even more cool bits to make your Wyches even more dynamic and deadly! 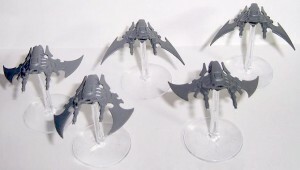 Given that Wyches are quite affordable it may even be worth to buy an extra box to replace the Raider and Ravager crews, which would look great in a full Wyche Cult-themed force. 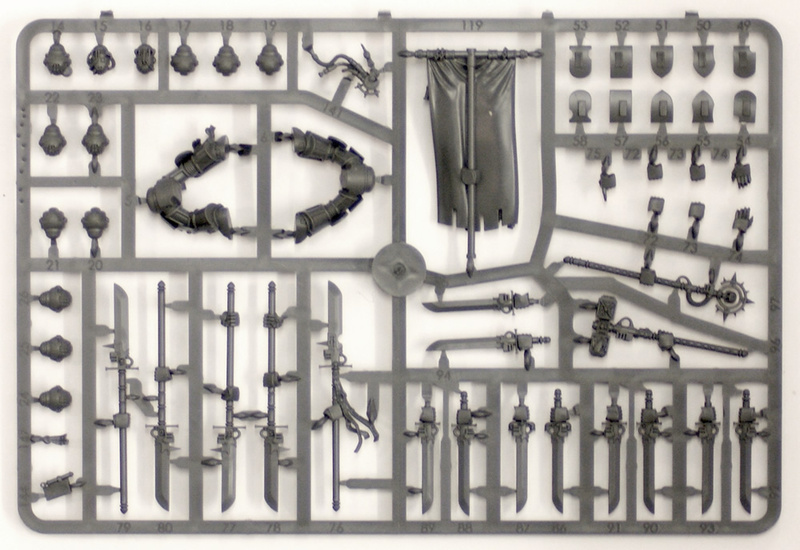 The Wyches plastic kit comes with enough bit to make 10 Wyches with nearly all of the options available to them in the codex. 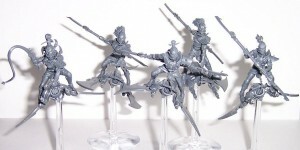 The models are very dynamic and versatile, being interchangeable with most other Dark Eldar and even Eldar plastic kits. The minis are easy to put together, requiring minimal preparation work, which is a good thing as the paintjob can be challenging at times. There is no arguing with the end result though, they really do look the part of sci-fi gladiators! So the final verdict is 9 out of ten stars! Though their origins are shrouded in mystery, there is one thing all Dark Eldar are in agreement about: Mandrakes are to be feared by all. Part Dark Eldar, part something much, much worse, Mandrakes are creatures of darkness. Darting from shadow to shadow they feed upon the suffering of others, utilizing the harnessed, raw power to freeze the unsuspecting with blasts of shilling energy. With dark, rune-carved skin, while wielding wicked, saw-edged blades and wearing the flayed skin of those who betrayed them, the Mandrakes stalk the battlefield appearing out of nowhere, channelling their chilling auras to reduce their victims to shattered heap of frozen flesh and armour. 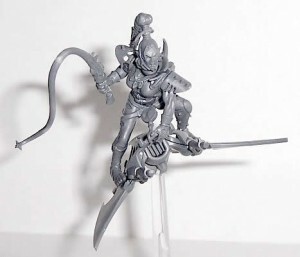 Mandrakess are an Elites choice for the Dark Eldar, competing with such units as Incubi, Grotesques, Wracks, Harlequins, Kabalite Trueborn and the Hekatrix Bloodbrides. There is no denying that people got really, really exciting when the first Mandrake preview popped up on the Games Workshop site. 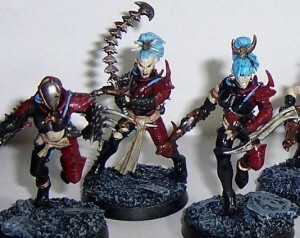 For those in doubt about the Asian influence in the Dark Eldar design, it became quite clear when looking at the excellent design of these miniatures. The Dark Eldar Mandrakes boxed set contains 5, multi-part, metal miniatures, and costs 18 pounds (or 14,56 if you buy it from Big Orbit games!). Thus making the set equally expensive as the five men strong Incubi boxed set. Though the box is certainly not cheap, this is to be expected given we are dealing with metal miniatures. Upon opening the box we are met by five metal miniatures, though sadly there are only three different poses in there. I can’t help but feel that it wouldn’t have taken GW a lot of extra effort to add two more poses. Each Mandrake comes in two parts: the body and their flaming left arm. In principle, each arm is modelled to fit one, specific body. So, without investing some extra time and effort, this does mean that you will end up with only three, differently posed Mandrakes. TIP – To add some easy variation to your Mandrakes you can exchange some of their weapons by gently cutting them off at the wrist. 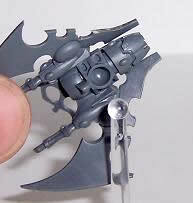 Next use a pinvice with a small drill to carefully drill holes in both the loose hand and sword, as well as the arms. It is a good idea to first use a sharp modelling knife to drill a starting hole in both the hand and the arm, as this will prevent nasty slips with the pinvice. Once you’re done drilling, cut a paperclip up and use the newly acquire metal rod to securely attach the hand to its new arm. Sure this takes some extra work, but the pin will prevent silly breaking accidents. For those wanting to add even more special touches to their Mandrakes I’d suggest having a go a using Green Stuff modelling putty to, for example, cover up a rune or two, make their Balefire larger, add extra hair or even to adjust the shapes of the skirts worn by the Mandrakes. Mandrakes are able to appear out of nowhere and move about rather fast due to their Fleet, Infiltrate, Move Through Cover and Stealth rules. Much like most Dark Eldar, they are fairly fragile being only Toughness 3 and having a 5+ Invulnerable Save. Mandrakes will really benefit from getting a Pain Token, as this will give them the Feel No Pain bonus available to most Dark Eldar. Not only will the Pain Token make them more durable, it will also activate their ranged Balefire shooting attack. Regardless Mandrakes are fantastic for gamers putting together themed armies, painters will have a blast with the many different textures and let’s just face it, they really look fantastic! I am even tempted to use them as count as Ur-Ghuls (tough fighting pets that can be included in an Archon’s Court). Let me be frank here, Mandrakes are a serious challenge. The runes on their skin are quite small, their dark skin takes time and painting fire isn’t always the easiest thing. Nonetheless I absolutely love these miniatures! In the past I have dealt with tough minis taking me less time than the Mandrakes, but that almost drove me insane nonetheless. The Mandrakes, challenging as they may be, are a delight to paint up. With every new element you add paint to they really start coming alive. TIP – Dealing with the Mandrake runes can be a tricky thing, this is mainly because you are working with an inverted colour scheme. Normally the deeper areas are darker, however the Mandrake runes glow with eldritch energies. I would advice starting from a white, or light, undercoat. After all it is no problem to paint the dark skin of a Mandrake over a white undercoat. The runes and their Balefire arms as well as the flayed skin skirts, on the other hand, will greatly benefit from the lighter undercoat. 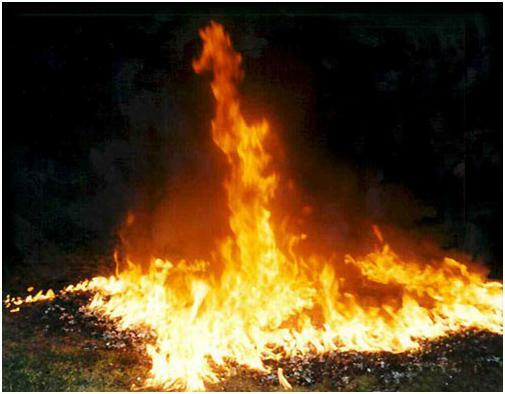 Secondly, there is the matter of Balefire. Personally I like to paint fire in a realistic manner, meaning that the combustion source (in this case the Mandrake’s arm) is the place where the most energy is released. As a result this spot is the lightest part of the flame, the further away from the combustion source the greater the chance of other colours showing up in the flame. 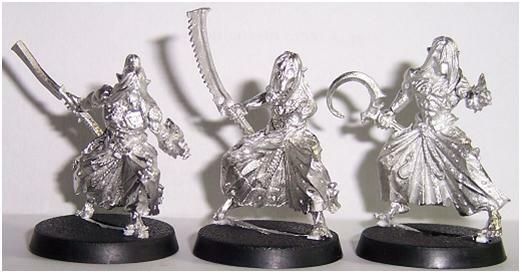 The Mandrakes boxed set contains enough metal parts to make five Mandrakes, in three basic poses. Without some conversion work you are unfortunately stuck with these distinct poses, something that does impact my final evaluation of this product. If you do decide to invest the extra time to do some converting you can fairly easily make your unit unique. Even if you decide not to convert your Mandrakes you will be spending quite a bit of time to make their paintjob look good. On the one hand I have a hard time justifying spending so much time on a unit that, at its maximum, is 90 points, On the other hand though they are fantastic to paint up, the minis really come alive as you come closer and closer to their completion. Gamewise the Mandrakes are certainly not a bad choice, they are quite good at what they do. However, I can’t help but feel that we will only rarely see them used in the more competitive armybuilds. Given that you can only buy the boxed set you are basically forced to take Mandrakes in multiples of five, something that is sadly also true for the new Incubi. In conclusion, I personally love the Mandrakes, but given their limited poses and the significant amount of time you have to invest to make them look have decent, particularly if you are a starting painter, I can only give this boxed set seven stars. Hellions are Dark Eldar that have live an existence outside the normal ‘protection’ of a kabal, instead they roam the desolate regions of Commorragh in large groups, who move about on agile, fast-moving skyboards. Wild and unpredictable the different Hellion gangs have been known to hire out their services to Kabals on raids, using their Hellglaive and skyboards to capture victims and claim grizzled trophies in battle. When the first picture of the new Hellions was released I was rather uncertain about them, but know I have the actual sprues in my hands I do have to say that these models continue the excellent design seen on the other Dark Eldar releases. 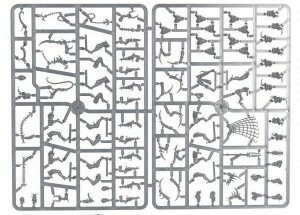 The Dark Eldar Hellions boxed set, which contains 2 A5 sized sprues, and costs the same as both the Kabalite Warriors and Wyches boxed sets. On the sprues you will find enough bits and bobs to put together 5 Hellions, one of which can be a Helliarch leader. In addition, all options available in the codex for a Hellion troupe of 5 men, are also included. Your Helliarch can be armed with a phantasm grenade launcher, a venom blade, a power weapon, an agoniser and even the rather cool-looking stunclaw. 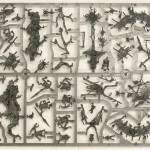 And, of course, these sprues also come with an assortment of extra skulls, spikes and trophies to add to your Hellions. Naturally the kit has a small instruction manual giving details about what is what and how everything goes together. A nice little bonus is that the spare page of this manual has an excellent Hellion artpiece on it, which you can also see in the codex on page 16. Each Hellion is mounted on a stylish and rather speedy-looking Skyboard. Each of these boards is mounted on a 3” base using a clear plastic rod. These rods both solve an old issue and leave another unresolved. On the one hand the rods are still notoriously difficult to fully insert into the hole on the base, pressure is needed and the danger of breaking is quite real. At the same they we no longer need to worry about the rod breaking off clean at its connection point on the mini. Heck no, each rod now comes with a ball at the end and the Skyboard has a nice socket on its bottom half. So we have less unrepairable breaking and more posing opportunities not only with this kit, but also with the Raider, Ravager and Reaver Jetbikes. TIP – I would advice using clippers to remove the Skyboards from their sprues, this as most of the points were they are attached to the sprues are curved. That way you can easily use a hobby knife and a file later to keep the curved surfaces intact. We then come to the Hellion bodies. Like the other plastic kits each torso comes with a front and back part and allows you to make three male and two female Hellions. You also get five pairs of legs, four of which are split in half. Luckily GW added a nice little A-D on the inside of each leg to prevent any botched poses. We then come to the heads and arms with Hellglaives. You get a whopping 10 different heads; 3 male without mask, 4 with mask, 2 females without mask and 1 with mask. 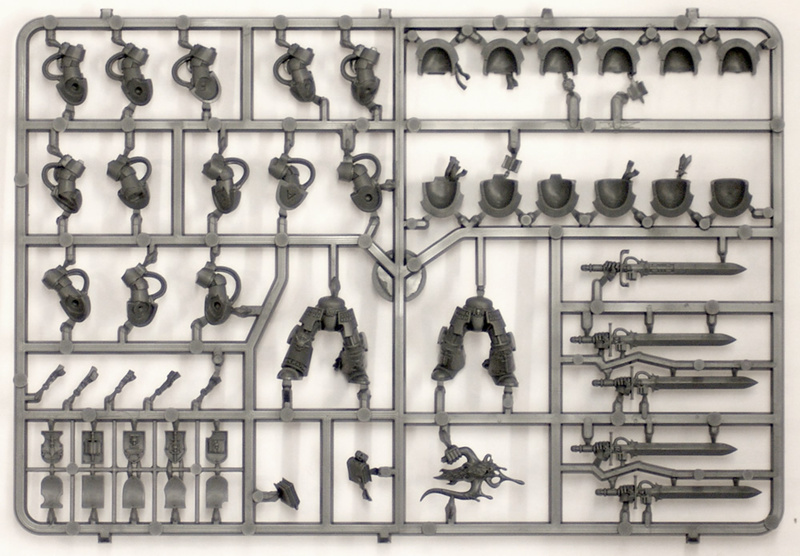 Additionally there are 7 Hellglaives, 6 with arms attached, on the sprue. Several of these come in two parts, with one of the upper arms being separate. Personally I am not a huge fan of the semi-dreadlock hair style of the heads, though the detailing is excellent. Although it adds a further unique touch to the Hellions, it does look slightly out of place if you try to add one of these heads to another unit like Kabalite Warriors or Wyches. So it works just fine for the unit, but may look out of place when kit-bashing. The posability of the arms and equipment are quite good and can be further expanded with only mild cuts and adjustment that even basic modellers shouldn’t have any problems with. The only real issue I ran into was trying to get the Stunclaw off the sprue in one piece, that thing is one fine and delicate piece of plastic! 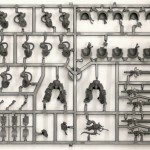 Finally by swapping heads and torsos with the excellent Wyches sprues, you can easily add a ton of extra variety to both a Hellion and Wyche unit. The cool thing here is that both units wear the same type of bodysuit, meaning everything still fits together perfectly. So you loose zero parts and do not have to sacrifice any miniatures at all. And, naturally, if you decide not to use the Stunclaw, I am certain it will look great in a Wyche unit. Those ladies love all kind of gladiatorial weapons after all! 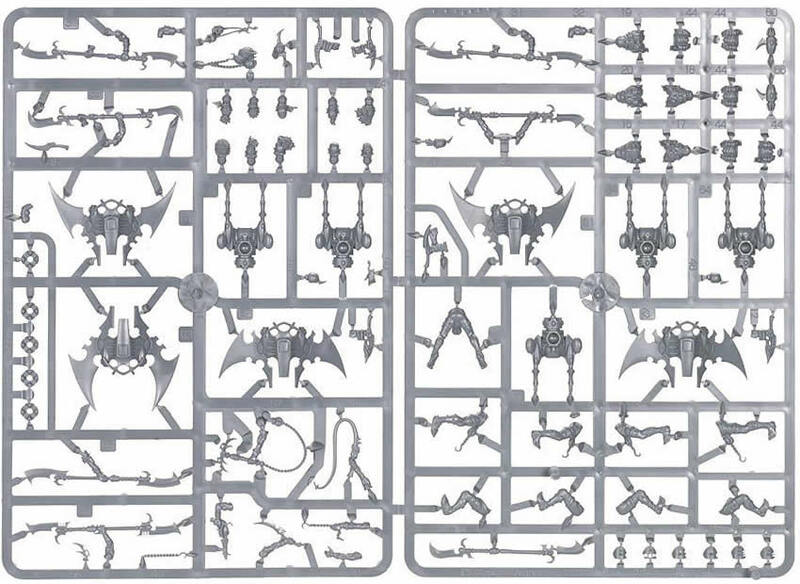 The Hellion kit contains enough parts to build 5 Dark Eldar Hellios, one of which can be built as a Helliarch and includes all the weapons options and upgrades available to them in the codex. The Hellions are easy to build and definitely look the part with their dynamic poses and the nifty ball-and-socket system on their Skyboards. Their bases and the plastic rod you have to insert into them do provide a potential weakness in the kit though. Their excellent posability and the potential to swamp bits with the Wyche kit, without sacrificing miniatures, makes it fairly simple to make a large, but still diverse looking, unit of Hellions. Now we just need to figure out where to find the bits to make a convincing Baron Sathonyx model! Pick up the Dark Eldar Hellions from this review at Big Orbit Games and save 18% off RRP*.